Use messages with a dress to mark milestones in a young girls life. 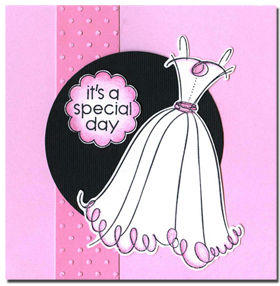 Cut a pink card to 4 1/4″ square. Stamp the message and dress onto scrap white cardstock. Color with pencils and cut out. Cut a strip of bright pink cardstock and use with an embossing folder. Affix to the card. Punch a circle from black cardstock, affix to the card. Adhere the message and dress in place. Sand the dots of the embossed paper to create more depth.